In going over some old photo streams, I came across this picture of Elia and Esther from 2010. I’m grateful for the boys being able to get to know their grandparents. 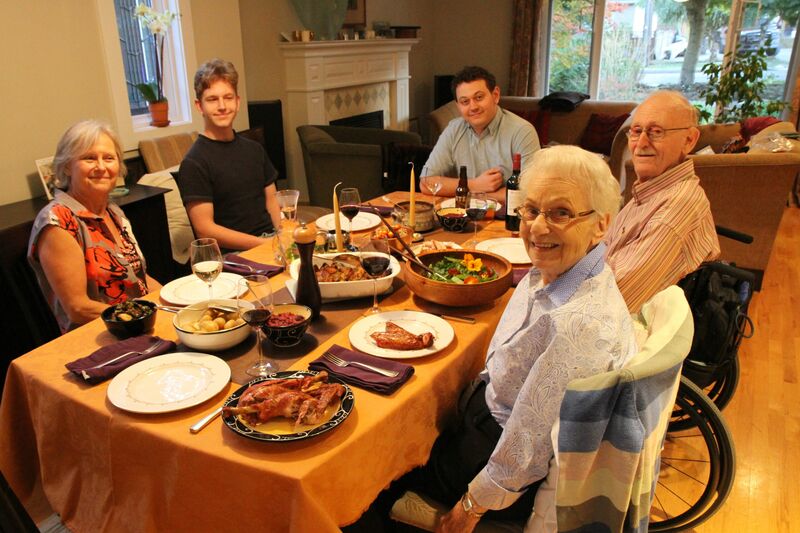 This weekend the family gathered around the table for turkey, home-made cranberry sauce, stuffing, gravy, and a ganze tzimmes, all contributed to by Esther’s grandsons. Here’s one of our family favourites from a couple years ago, we miss you Esther. What can I say after thirty days of waves of memories of my dear wife? Perhaps only the things that I am truly grateful about. That a woman could love me for what I am. That Esther could be happy with a little hug now and then. That I wish I could have hugged her more. That she could make me enjoy people and appreciate our friends more deeply. That we could enjoy art and drama and music together. 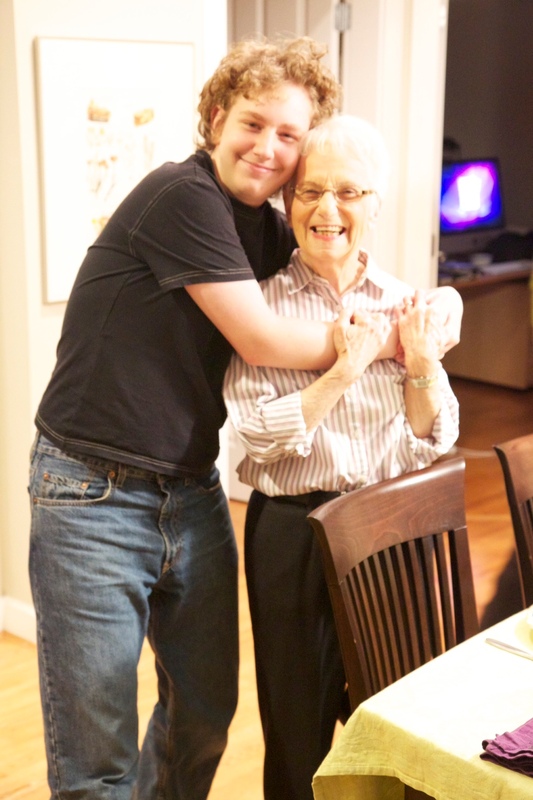 That she would enjoy cooking and ask me to find new recipe ideas from the myriad books she had collected over the years. That we could go on walks together, even in the frigid cold Edmonton winter and not say a word, but just enjoy the fact that we were together and hold hands.That her smile would lift my spirits when I got home after a frustrating day at the TV station. That she never complained that we did not have much extra money in the early years for things we wanted for ourselves and our son. That together we raised a son we were so proud of and say to each other “we must have done something right”. That we had such wonderful warm and caring friends who helped us through difficult times. That Esther would take the car and visit me every day in the hospital while I was fighting cancer for five months.That she would schlep my wheelchair into the car for over six years till we came to Vancouver. That even in the early stages of her dementia she appreciated my help with her verbal communication challenges. That even in the later stages of her disease, when I would visit her at the hospital and I would see her sitting by herself, lost in her thoughts…as soon as she saw me, she would shout (quietly) “dan” and smile and open her arms to me. She was my companion and my best friend. My memories and her spirit will always be a part of my life. 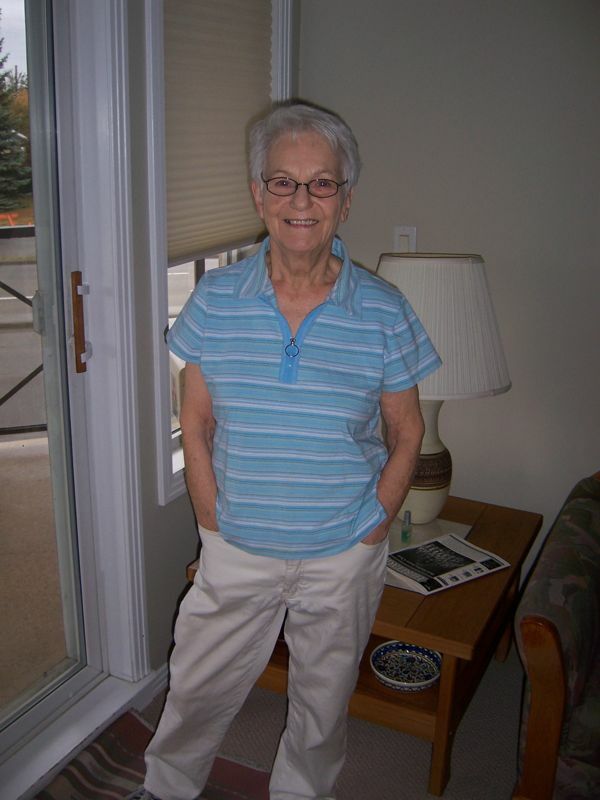 If you are moved to, a donation in Esther’s memory can be made to the Alzheimer’s Society of BC. As we approach September 10, that marks 30 days since Esther’s death, this web site is dedicated to her memory. We spend a lot of time reading in our house. One of our favourite sci-fi writers, Spider Robinson, is famous with me for his observation known as Callahans’ Law – “Shared pain is lessened; shared joy, increased — thus do we refute entropy”. We are very grateful to you, for this holy community, who come together at times of joy and sorrow. When we return to being dust and ashes, how do we mark our life’s passage? For Esther it is in the many many lives she enriched. I don’t think she ever had to reach into her left pocket. Growing up, being Esther’s son was both joyful and challenging. I have very fond memories of her easy laugh, of going shopping with her rolly basket, of pie at Woodwards and crumpets and tea at Johnstone Walker in Edmonton. I was amazed then, as I am today, of how she seemed to know the names and family background of so many people, from the produce manager at Safeway to her favorite checkout people. It was a challenge because my Mom had very high expectations of me in especially two areas: politeness and empathy. Those sound like simple childhood lessons as I say them out loud to you here, but trust me when I say that even though she was only 5’2, Esther was a fierce promoter and defender of both these value, and that those labels – politeness and empathy, were simplistic abbreviations for much deeper values. Esther insisted on me being polite. Please, thank you, wait your turn, let that person go before you, say hello and goodbye, listen before you speak, dont interrupt. She would be more upset with me for rudeness than for breaking something around the house – her values were clear about the importance of treating people well. The other attribute Esther manifested through her life was an extremely high empathy. Her early lessons on that to me were simple – “How would you feel if someone did that to you?” After the usual hundreds of times it takes a parent to relay a lesson to their children (), the step of considering the effect and feelings on the person I was about to tease, laugh at, or hit eventually sunk in and made me a less impetuous, and hopefully kinder person. When Esther saw a clique that was excluding one of the other girls, she engaged them in dialog with that combination of unvarnished truth, outrage, her deep sense of fairness, topped with a dollop of guilt, to encourage inclusiveness. Mom, in a few minutes we will commend your body back to the earth, and help your beautiful neshama go free, the neshama that was getting increasingly hard to radiate as your brain became a cataract to its glow. In our mystical tradition the Zohar tells us that Esther’s neshama is still near, in the process of rising upwards to the light of creation, where after a brief time to be cleared of the pains and mistakes of this world will be free once more. If it should be your choice, perhaps the world will be blessed with your soul once again, to bring compassion, awareness, and wisdom to another community and to a family who loved you as much as we did.